Making Christmas pudding is one of those things that has died out over recent years. It seems everyone’s in too much of a hurry , which is a shame as it’s remarkably easy to make Christmas puddings and not as time-consuming as you might imagine. Yes, they have to be steamed for a couple of hours but you only have to take an occasional peek to make sure the pan isn’t boiling dry so it’s not really that much of a tie. 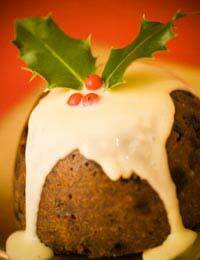 Traditionally Christmas puddings are made on Stir Up Sunday, the last Sunday before Advent in the church calendar that falls in mid to late November. Stir Up Sunday takes its name from the prayer for the day that invites God to ‘stir up’ his congregation. But don’t worry if you’ve missed that day, there’s still time to make this pudding for Christmas. We asked Jenny to talk us through her annual ritual. “There’s something very special about making your own Christmas puddings. It’s to do with memories but also about creating your own traditions that you hope will be meaningful to your children as they grow. “I usually plan to make mine on a Sunday afternoon so the children are there and can all have a stir and make a wish. I get on with other things while the puddings steam and the house is filled with the delicious smell of fruit and spices. This basic mixture is enough to fill 1 two-pint basin and 1 half-pint basin or an equivalent number of smaller-sized basins. “I’d started putting the ingredients in the bowl when I realised I didn’t have any blanched almonds. I did have some ground almonds so I added those instead. Then I found a packet of mixed nuts so threw some of those in too. And then I thought I’d better increase the liquid as the ground almonds would absorb it. “I use plastic lidded pudding basins. It’s a lot easier than the old-fashioned way of using greaseproof paper and foil or, in my grandmother’s day, of tying cloths onto the basins. Plastic pudding basins are available online in different sizes. If you want to use china basins, place a circle of greaseproof paper or foil in the bottom of each. “Divide the mixture between your basins. Fill the basins to about 1 cm below the top and don’t press the mixture in too firmly. Cover with the lid or a layer of greaseproof paper folded to make a pleat and a similar pleated layer of foil. Tie securely. “Place the basins in a large pan on a trivet if you have one or an upturned saucer. Pour in water to come about halfway up the side of the basin and bring to the boil. Lower the heat so that the water is gently bubbling and cover securely. The idea is to keep in as much steam as possible. Check occasionally and add more boiling water if necessary. “Steam a two-pint pudding for about 4 hours or 2 hours for a one-pint basin. The longer the steaming the darker the colour. I usually make lots of small puddings – the quarter-pint size will be enough for 2 people after a large Christmas dinner – and I steam them for 2 hours or more.